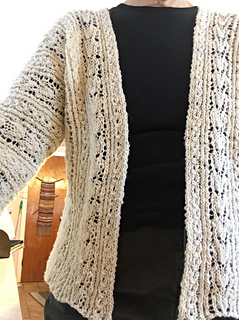 This open front cardigan, which uses clean simple lines and a deceptively easy lace pattern, is constructed in only 3 pieces. It was inspired by the famous Chanel Jacket, a designer that the elegant Gold Coast matrons would have worn. Pattern includes directions for short sleeve length and long sleeve length. Sizes S, M, L requires 3 (3, 4) skeins for short version or 3 (4, 4) skeins for long version. 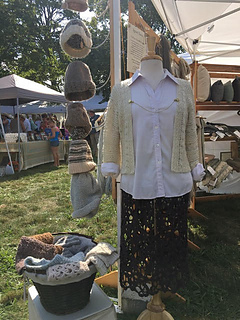 Like all Long Island Livestock Company patterns, this one is free with the purchase of the yarn to make them. Long Island Livestock Company yarn is sold at yarn shows such as Vogue Knitting Live and NYS Sheep And Wool (Rhinebeck), and occasionally on the website at lilivestockco.com/yarn/ We are also happy to send you photos of our current offerings!